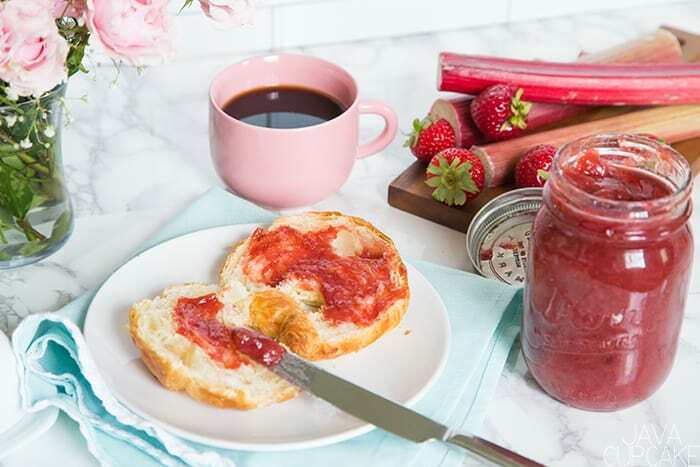 Tart and sweet is the perfect combination of flavors to make small batch Rhubarb Strawberry Jam out of this world delicious! There is just something about fresh fruit and making jam that I just can’t get enough of. 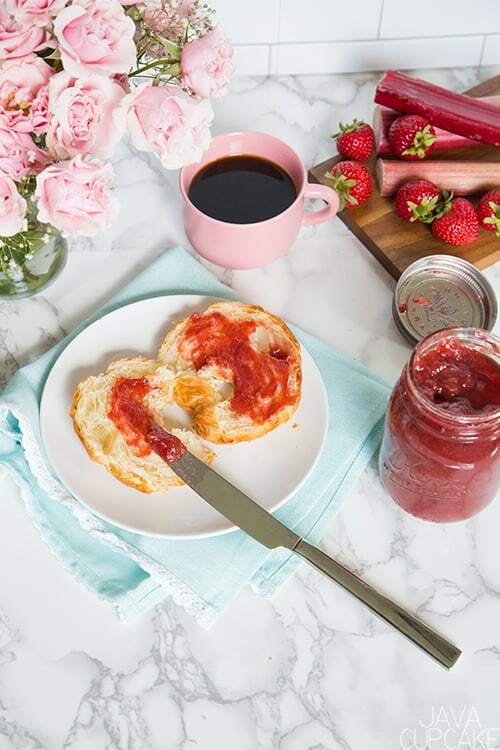 Especially as summer is winding down, I love pulling out a jar of homemade jam from the fridge, spreading some jam on a croissant and enjoy the sweet, tart flavors. Every summer, I try to make at least one thing featuring rhubarb. This year it’s small batch Rhubarb Strawberry Jam! 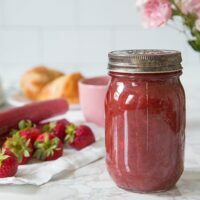 Not only do I have jam for you today… but I’m also celebrating the birth of a new little baby boy to our blogger community! Angie from Big Bear’s Wife welcomed her sweet little boy into the world this week and our blogging community is throwing her a Virtual Baby Shower to celebrate! Make sure to scroll to the bottom and check out all the other delicious recipes from our great community! Can we just take a minute to admire these gorgeous photos? I feel so blessed to have found Fanette of Frenchly Photography! She has elevated the look of my blog by 1000% because she is so incredibly skilled in food photography! 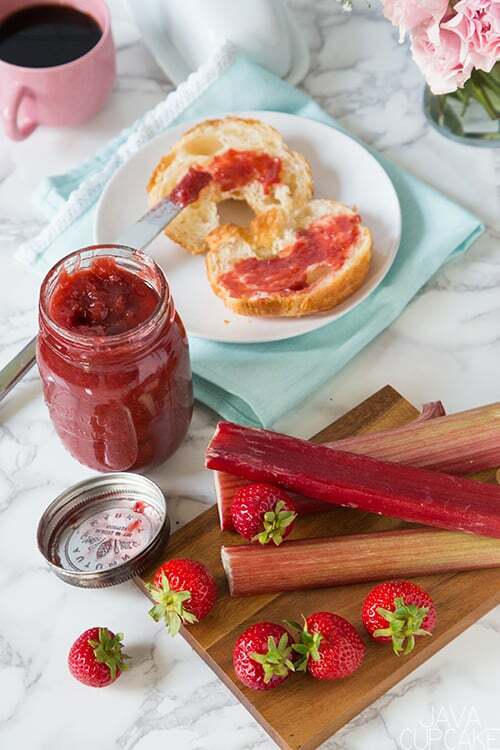 Back to the rhubarb strawberry jam! 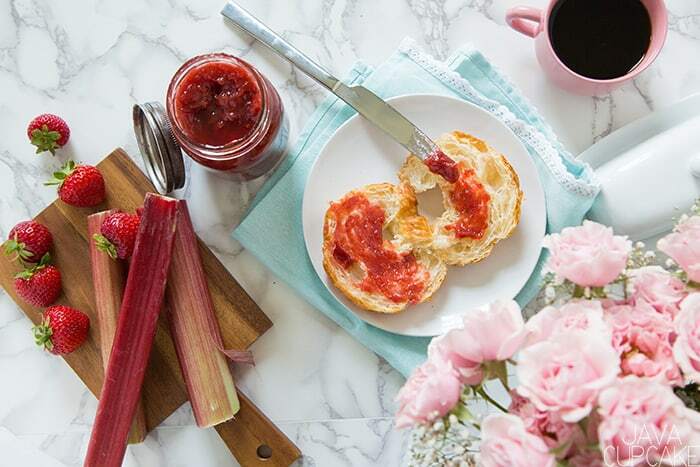 Let me tell you how incredibly simple this jam was to make! Seriously. I looked up a few recipes online and compared ratios of fruit to sugar. What I realized was that there is no right or wrong way to make jam. It’s really about how sweet or tart you want it and how much you want to make! 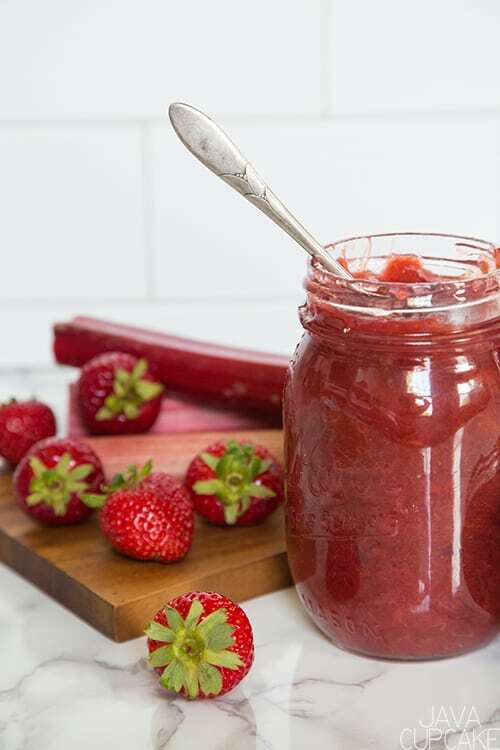 Since I only had a few stalks of rhubarb on hand and I needed to use up some strawberries before they went bad, I diced all I had and tossed it in the pot! I knew I didn’t want it too sweet, so I kept the sugar amount low. The vanilla added a depth of flavor to the jam and the lemon a tang without being too strong. To be honest, it’s one of the best jams I have ever made. Seriously. It was so good I wish it wasn’t a small batch but a HUGE batch! Don’t forget to scroll down past the recipe and check out the rest of the blogs participating in Angie’s baby shower! Over medium-high heat, mix together the sugar and fruit until coated in a medium sauce pan. Add the vanilla, lemon peel and juice and combine. Cook until the fruit begins to break down and the juices release, stirring constantly. Depending on how chunky you want the jam, be careful how much you break up the fruit. Reduce heat to low and simmer for an hour or so, stirring often. The mixture will begin to produce a white foam and begin to thicken. 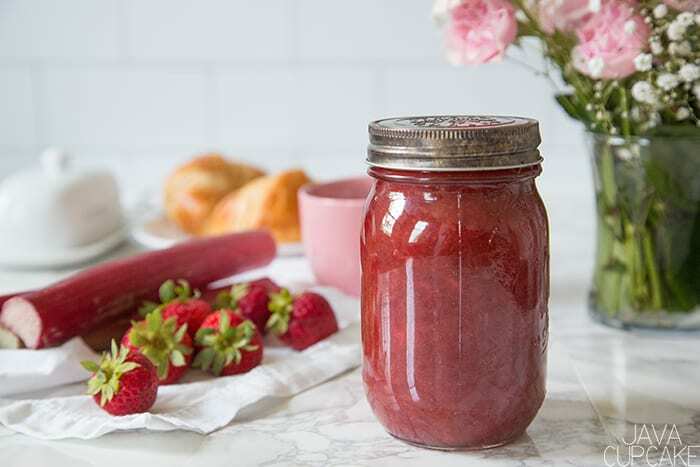 Pour into a clean glass jar and set out to cool at room temperature. Store with a lid on the jar in the fridge. Keeps several months or until you eat it all! I definitely need to make a batch of this in the spring. My parents have a rhubarb plant and our strawberry patch just doubled in size this year! What a perfect shower treat! I love this jam and those photos are beautiful!! Thank you so much for being a party of my virtual baby shower to celebrate Baby Jackson!!! This jam sounds delightful! 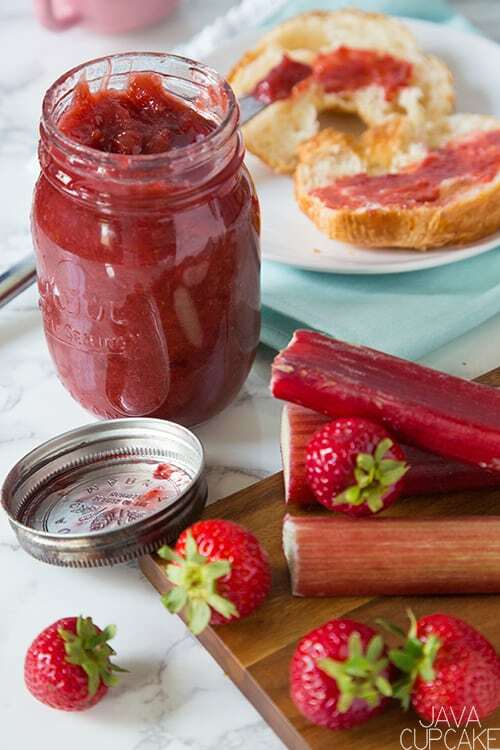 I’ve always shied away from rhubarb, but I really want to try this.